Charter a private jet at a fraction of the cost when you book an empty leg flight from Phoenix Jet Charter! We have instant access hundreds of jets in Arizona and thousands of charter planes across the country, letting us find the best empty leg deals in Phoenix, Scottsdale, or wherever you’re located across the state of Arizona! There are hundreds of private planes based at airports throughout the Phoenix metropolitan area. Let us find a transient plane at Sky Harbor, Deer Valley, Goodyear, Scottsdale, Falcon Field, Mesa, Glendale Municipal, or Chandler Municipal and offer you the best deal for your private flight! Charter companies based at local airports can only offer empty planes in their fleet—our jet charter company is global, with direct access to transient planes from coast to coast and around the world so you never miss out on any empty leg specials. Looking for empty legs to Phoenix or transient planes in Scottsdale flying across the United States? Give us a call or request a quote, and cut the cost of private jet travel with an empty leg from Phoenix Jet Charter. Call us 24 hours a day +1-888-987-5387 and learn more about how you can save up to 50 percent or more on the cost of private flights with an empty leg in Phoenix, AZ! What is an empty leg? Whenever a plane is scheduled to fly without any passengers on board, it is considered an empty leg flight. This most often occurs when a one-way flight is booked, and the cost of the return leg is factored in. For example: a client in Los Angeles books a one-way flight to Phoenix Deer Valley Airport from Van Nuys Airport, and the cost of the return leg is included in the price. After landing in Phoenix, the plane must now return back to LA, with or without passengers. Charter operators then market the empty flight at a substantially reduced rate, allowing you to fly private for a fraction of the cost! It can take time and patience to match your routing with a transient charter plane. Empty leg deals come and go as new flights are booked daily, and it helps being able to see all of the planes on the market to find the best price. Find an Empty Leg to/from Phoenix, AZ? There are hundreds of charter companies out there listing deals on thousands of planes. How can you find the best empty leg deal in Phoenix for your next flight? 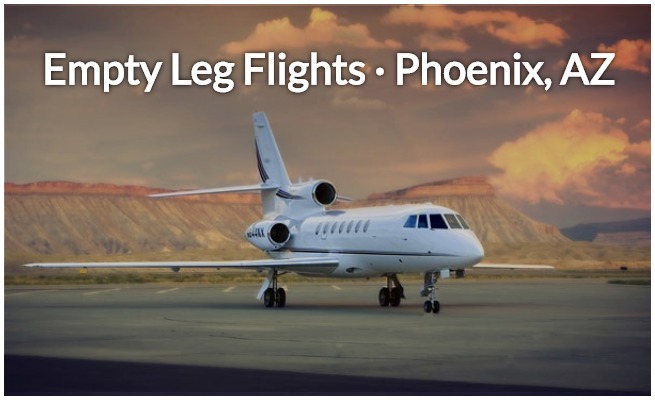 Call and request an empty leg flight from Phoenix Jet Charter! Our brokers have access to every plane available for charter around the world. We’re not limited to any one fleet, and we don’t answer to aircraft owners, either. We only answer to our clients, offering the best rates for every flight to/from Arizona. The more flexibility you have regarding the dates, times, and airports for your trip, the better your options become when trying to find empty leg deals. And if one isn’t available, we still offer the most competitive rates on the best air charter services in the Southwest! We offer 24 hour private jet services around the world, with access to planes no matter where you’re located. Getting a charter quote for deadhead flights to/from Phoenix is free—don’t miss out on the chance to save on the cost of private jet charters! 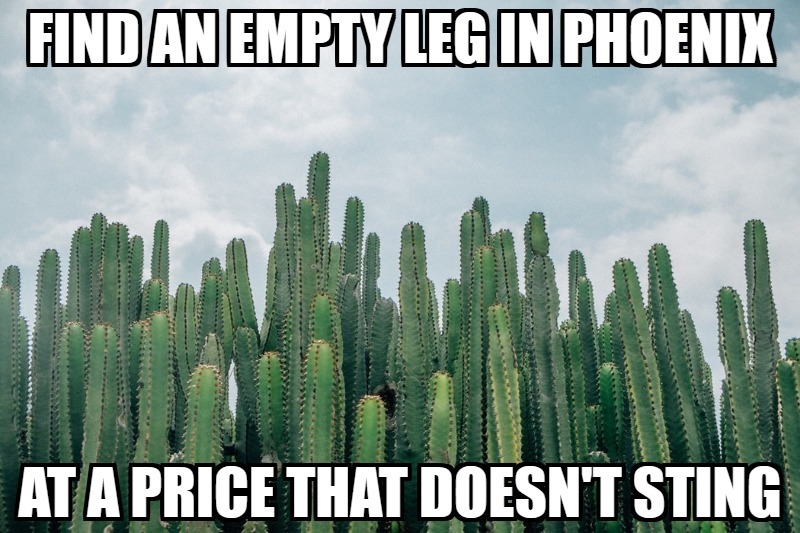 Call or email us for more details on empty legs to/from Phoenix, AZ!